Luke explained: “Fossils by themselves don’t tell us much about how plesiosaurs actually moved. Short of genetically engineering a plesiosaur, our best available option was to create a robot to show how it might have happened. 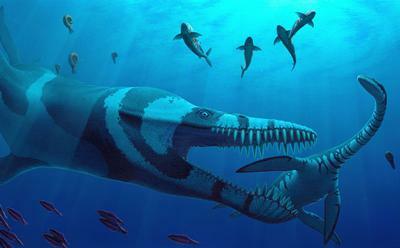 “The results were amazing and indicate why plesiosaurs were such a successful species, retaining four flippers for more than 100 million years. If this wasn’t the case, it’s unlikely the four-flipper system would have been maintained for so long. “Understanding how an animal might have moved gives us a better understanding of the animal as a whole – for instance, how far it can travel, what animals it can predate on, and what it might have fallen prey to. “Our observations of tandem flipper systems such as the plesiosaur’s might also eventually have a real-world application – as a propulsion system for undersea vehicles, for instance, that could help make them more manoeuvrable, efficient and quieter."